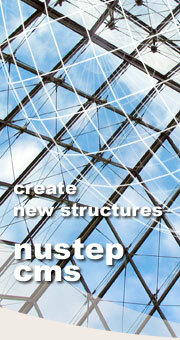 NUSTEP corporation provides complex web solutions. We see web as a basic medium for application development, thus not only as another application in distributed environment. Application that is not available from the web appears as non-existing today. Our solutions provide highly efficient management of information on the web, enables to keep the information current, accurate and available, enabling effective utilization of human resources. Our goal is to provide our customers complex web solutions on the highest technology level.